Beth is definitely going to be the first one to complete her "orange" jacket. She worked on the lining before she left the studio, so there's just some hand sewing to finish it up. Barb sent us this picture of her modeling her new bog coat . 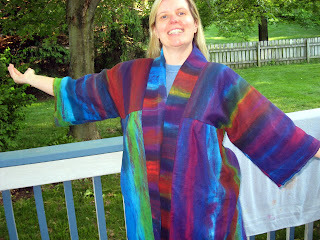 Her hand-dyed linen/rayon fabric looks great and is going to be very comfortable to wear. Priscilla now has the front pieces of her jacket (on the left) completed, which include some seminole strips and other strip piecing. The back piece is on the right. More fabrics are being considered for the sleeves. I have the back of my jacket sewn together. The focal piece is a Chinese flower collar that Priscilla brought. The blue indigo fabric also came from one of Priscilla's recent trips. The gold strips were cut from a hand-woven silk scarve from Laos, and the green and orange cottons were hand-dyed. Priscilla brought some Ecuadorian rugs for Show and Tell, and Inspector Suki immediately jumped to the task of checking them out. Suki and I liked the red rugs the best, so Priscilla now has only the blue ones left for sale!